Acer America, part of the world’s third largest PC vendor , announced the new Veriton N260G-U2802CP, an ultra-compact nettop for the U.S. professional market. It will be available via Acer’s authorized resellers with prices beginning at just $399. Housed in a sleek one-liter chassis, the Veriton N260G maximizes space whether it’s placed upright with its retractable stand or attached to the back of a display. Due to its small size and flexible design, this practical nettop is well-suited for small offices, reception areas, classrooms, libraries, showrooms, call centers, hotel front desks or airline check-in kiosks. The Veriton N260G-U2802CP combines a low power consumption Intel® Atom™ processor with an Intel® GN40 Express Chipset, a practical platform for basic productivity and Internet-based applications. With up to 2GB of memory, a 160GB(2) hard drive and Intel® Graphics Media Accelerator 4500M, the Veriton N260G has ample storage and can playback high-definition videos and display sharp images in vivid color. 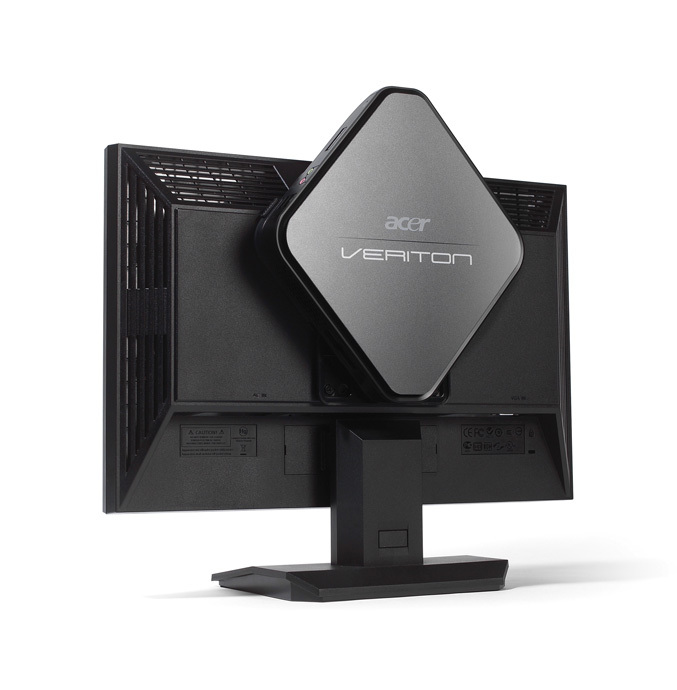 The Veriton N260G is Energy Star qualified and given its extremely compact size, it uses less material and packaging than other PCs. It also features Acer PowerSaver, which gives users the option to conserve energy and power on demand. A VESA mounting system enables the nettop to easily adhere to the rear of various displays. This space-saving all-in-one capability makes it easy to fit in almost any work area. The VESA mount offers vertical adjustment to ensure that the power button and memory card reader are perfectly accessible from the top of the LCD display. A screw-less chassis eases upgrades and maintenance, while a smart design ensures neat cable management and quiet operation. In addition, the OneButton Recovery re-set pinhole restores systems to retrieve documents in case of a power failure or other issue. The nettop comes with an array of ports for connecting to a wide array of peripherals and digital devices. These include HDMI to deliver crisp, high quality images, a multi-in-1 card reader, six USB 2.0 ports, high-definition headphone and microphone jacks and a PS/2 slot. WiFi 802.11 b/g/Draft N and Gigabit Ethernet are also provided to deliver users an efficient, secure and stable LAN connection. Acer QuickMigration quickly updates and transfers personal data from one PC to another using a common network cable. Acer PowerSaver configures power levels according to computer usage; low power for normal use and energy saving, and high power when top performance is required. Acer eLock Management offers password protection to lock removable data devices, optical drives, and other interfaces to ensure that data can’t be stolen. Acer eSettings Management offers an intuitive interface for configuration and control of the system. The Acer Veriton N260G-U2802CP is now available in North America via Acer authorized resellers with prices beginning at just $399.